I don’t know what it is, but I’m cooking a lot lately. Nesting, maybe? It may not be helping me to keep my girlish figure, but oh, I’m enjoying it. The photo stream on my phone looks like a foodie’s Tour of Carbs…. probably the result of my going low-carb for several months in late 2011. WordPress very helpfully noted in its year-end summary of my blog that “cranberry oatcakes” was the search term that most often brought readers to my site. I’ve decided not to fight it, and you’ll probably get a look at some of my creations here more often (they normally live on Facebook; I guess this will be their new, occasional, pied a terre. In no particular order, my most recent food explorations. No recipes included, but if you want one, just request it in comments…. Oh, and the second most requested search term? 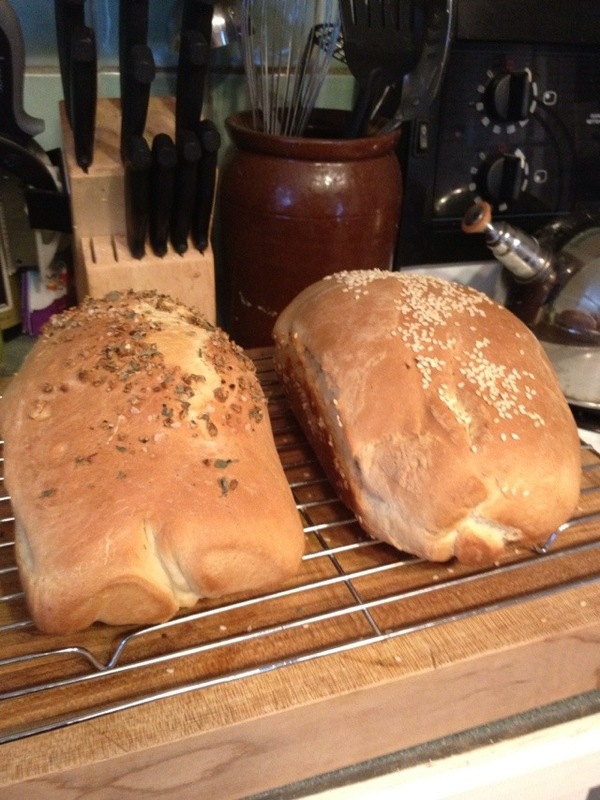 garlic/thyme bread, and sesame seed bread. It is delicious, and yeasty warm butter-drippingly fabulous. 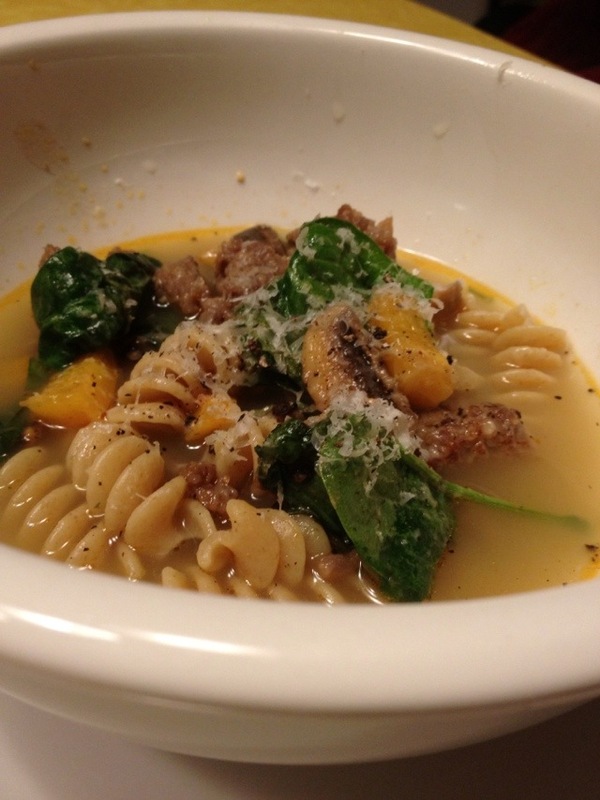 For dinner, we had Italian Wedding Soup. It was spicy and warm and comforting, but also seemed fresh and bright – really clean fresh and green. That’s the spinach and spicy sausage meat, marrying together. I hope they have a long happy life together. A few days ago, I took it upon myself to explore the homely popover. They are a remarkable concoction – fluffy and high, crisp and warm outside, but soft and almost like custard inside. I made a savory one for dinner, with peppered bacon, spinach, tomato, onion and parmesan. 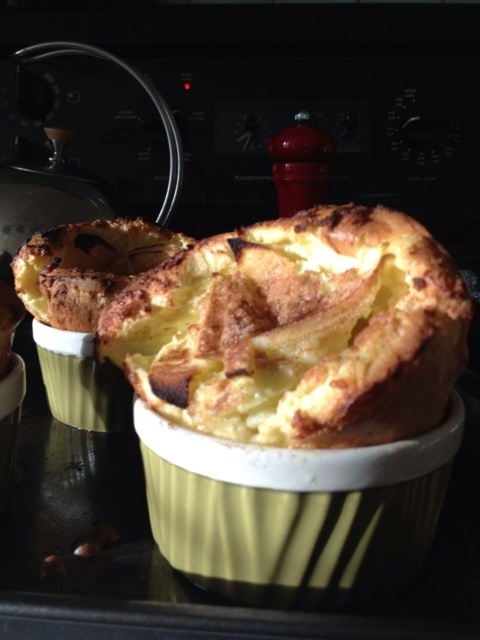 Then the next day I had no choice but to try my hand at individual apple popovers. no choice, I tell ya. And then there is the best of all. 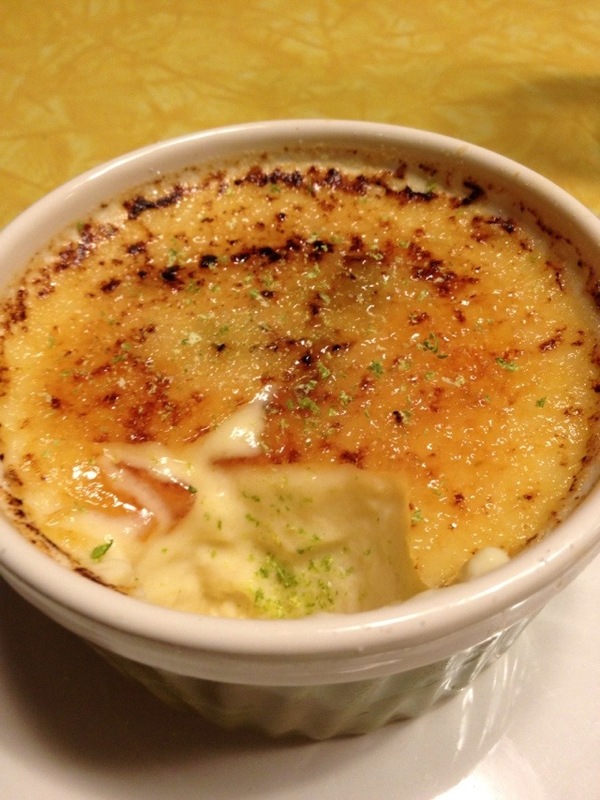 The creme brulee. Oh my. Lime infused, heavy on the vanilla. Creamy, crunchy. Hot, cold, smooth and sharp. Is there anything nicer? Nothing much else to say, except that I feel like I’m learning things, and it’s nice. It’s one of my happy places; that space I inhabit when I am puttering in my kitchen, puzzling through recipes, and figuring out the spot where science and art meet on my plate. Your bread comments reminded me of the German potatoe bread at Tait’s Bakery. Nobody makes it up here and it is awesome for sandwiches. My quest continues, but I could not be so ambitious as to make my own. Rather impressive food list. Joan, I’m so glad to see that you’re back posting. Just last week I was wondering if I had inadvertently unsubscribed to your blog. I realized that I hadn’t and the next day you posted! 🙂 I missed ya! Thanks Yvonne! I just took some time off, I guess. I hadn’t planned on it, but sort of just… stopped for a while. I like blogging, so will try to do more often from now on. Your photos are always so inspiring! Good job! PS: Every dam one of them looks delicious. That all looks delicious but I think you added a little too much salt…to my wound. Oh dear. 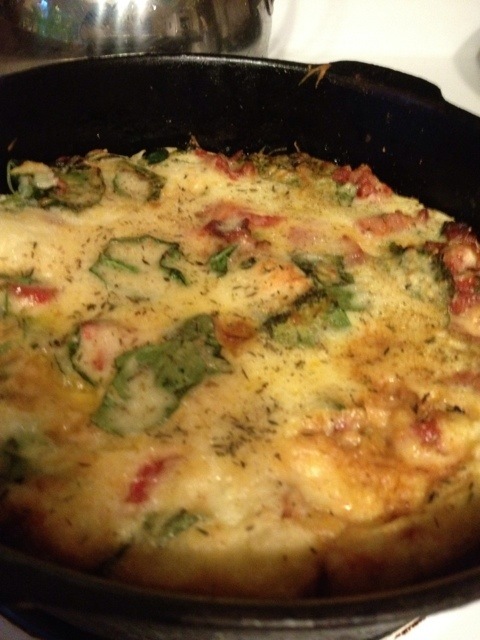 I’m sorry… Keep track of what looks good and I will make it for you when you get home. Deal? It must be the change in season, Joan. I am cooking and baking a lot too. The cat has not given me any feedback to let me know how I am doing. However I actually share with a bachelor friend and my mother. I have Fred believing I am the best soup maker in Guelph. My mother only wants plain food but she doesn’t say no to what I give her.